Hamilton clearly isn’t a show that needs to rely on stunt casting to succeed. But if there’s one part tailor made for a celebrity cameo, it’s King George. The comic relief role is basically only onstage for three quick songs, which is a pretty cushy schedule for a Broadway star. And the part is all but designed as a scene-stealing one. Now after having been played by Brian d’Arcy James (off Broadway), Jonathan Groff (on Broadway), and Rory O’Malley (as Groff’s replacement), Taran Killam is the first non-Broadway celebrity to step into the role. The former Saturday Night Live star will make his Broadway debut in Hamilton on January 17. No end date has been announced yet, although Groff played the role for about a year while O’Malley’s tenure will total about 10 months. 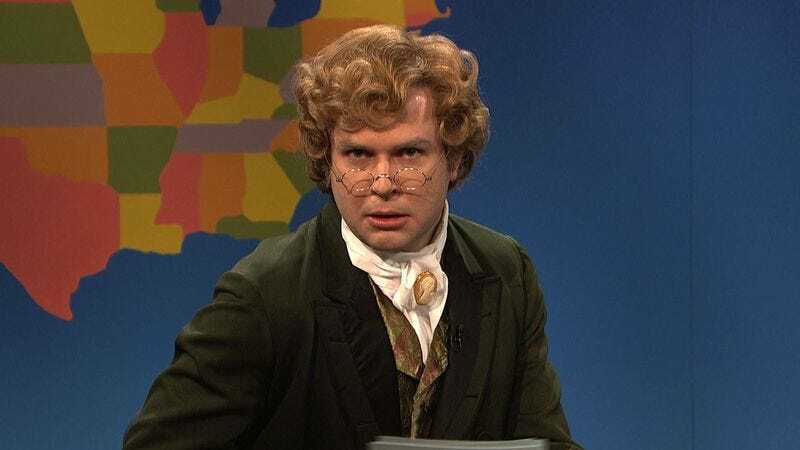 Killam is a pretty natural fit for King George, who is basically just one step removed from the officious 1860s newspaper critic Jebidiah Atkinson he played on SNL. And, of course, the casting announcement will also allow everyone to reminisce about the time Killam played a pop heartthrob in a Disney Channel Original movie called Stuck In The Suburbs.